Venice has a reputation for awful restaurants with 'tourist' menus, but take this with a pinch of salt. It’s far from impossible to find a decent meal here and you don’t have to venture much further than Piazza San Marco to do so. 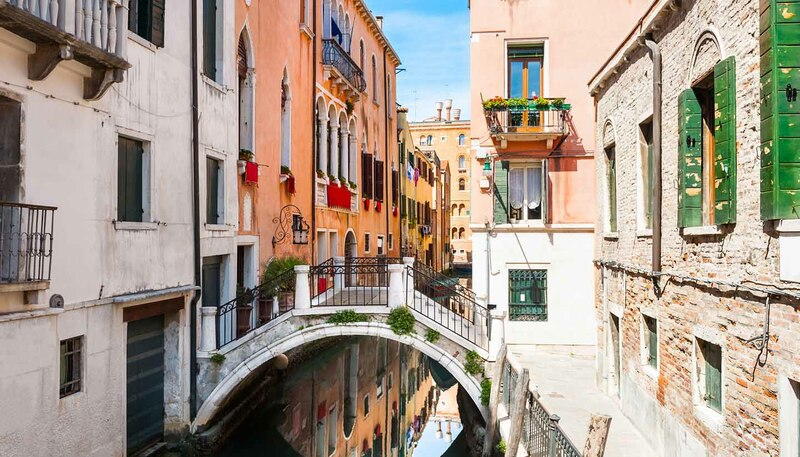 There are a number of very good restaurants in the Castello area with great food and if budget is not an issue, many of the best restaurants have canal views or private gardens. Prices include a three-course meal for one, half a bottle of wine, plus tax and service – usually 15% added to your bill. Beware of a ‘cover charge’ for bread and napkins. Boasting one of the grandest dining rooms in the whole of Venice, with space for only 65 guests, Il Canova offers an intimate setting and personal service that is second to none. The food is a true reflection of the Mediterranean, while the wine collection is chosen to complement each course. Telephone: +39 41 528 9840. The menu at this charming osteria, offers a wide range of appetizers, including soused, boiled or "saor" (classic Venetian specialty) raw fish. Handmade pasta is served with seasonal fruits of the gardens from the Veneto region, while main courses range from fried foods to grilled fish. Telephone: +39 41 528 5239. In the Belmond Hotel Cipriani, newly opened Oro manages to strike a balance between elegant fine dining and warm, family-like hospitality. The menu by Michelin-starred chef, Davide Bisetto, is an explosion of flavour combinations and highest quality produce. Its Venetian Lagoon views are also stunning. Away from the main tourist streets, this is the place to go to experience some innovative Venetian cuisine. With modern photography adorning its smart grey walls, the decor is unusually contemporary for Venice. Try the platter of fish carpaccio, mixed fried fish or the squid ink seafood pasta. Telephone: +39 41 521 1021. Run by the friendly husband and wife team of Isabella and Dino, this fine restaurant offers local fish and seafood and classic Venetian dishes like stuffed fried zucchini flowers. The owners go out of their way to make every guest feel welcome and the restaurant's own olive oil makes an excellent memento. Telephone: +39 41 522 2170. Venice's oldest trattoria is located a few minutes from Piazzale Roma station, but is definitely off the beaten tourist track. A favourite among the locals, the Mediterranean food here is simple but is often styled like a piece of art. Telephone: +39 41 721 687. This intimate restaurant is popular with local gondoliers and has been run by the same family for over half a century. Housed in a 15th-century chapel, Al Giardinetto boasts vaulted ceilings, a frescoed fireplace and a menu of Venetian staples. Grab a table in the vine-covered courtyard during summer. Telephone: +39 41 528 5332. Spaghetti alla busara con scampi (scampi in tomato sauce) and spaghetti vongole (spaghetti with clams and white wine) are two of the best dishes served in this bustling restaurant, where most diners sit outside watching the action on the wide Via Garibaldi. The menu is packed with other Venetian specialities – including an owner who likes to sing Venetian songs. Telephone: +39 41 522 8727. This bustling trattoria is good value. At lunch it’s a great informal place to tuck into a bowl of pasta with fagioli beans. In the evening, the more serious dining gets under way, with seafood specialities such as black squid with polenta and octopus on the menu. Telephone: +39 41 522 3824. Almost all of Venice's Gondolieri are men. Paula Hardy meets Jane Caporal, the renegade sticking her oar in to change all that.